In this topic we will touch on a very important and complicated issue—peculiarities of game universe simulations, which are usually seen as bugs. These issues mostly deal with gameplay and may affect the course of battle. In addition, they contradict our vision of the real world. We are going to shed some light on the reasons why such situations occur in the game and why it takes time to fix them. Such in-game situations occur because the tracer and animation of the flying shell are drawn in the client with a small delay as compared to the real speed (~80% of the speed). The purpose of such a delay is to avoid the so-called “visual overshooting”: when a tracer is displayed beyond the impact point after the shell hits an object. As a result, when firing at a moving tank (especially, when a shell with low velocity is used), it may seem like the shell goes through the tank. A similar situation may occur, when the tracer of an enemy shell goes through material objects upon destruction. The flight of a shell is simulated on the server at every step of in-game virtual time, as the server is unable to determine in advance at which point the shell will hit an object. When the shell hits the target, a separate command is sent to the game client. So it is impossible to display the shell and tracer in the client without a delay. Some touch-input devices have certain peculiarities in the operation of the screen, which can sometimes incorrectly process touch commands. This results in the incorrect operation of the controls and camera. This situation is rather difficult to fix because if commands coming from the touch screen are “smoothed out”, tanks will lose their dynamics, which will have an adverse effect on the game process as a whole. So we are looking for a compromise solution in order to ensure a comfortable game for most players. - In Arcade Mode, when you aim the marker at nearby vertical objects (except tanks), the gun intentionally ignores the marker to preserve a horizontal position and to be able to quickly take a shot after driving from cover. This is an example of game specifics, not a bug. - In Sniper Mode, the edges of objects displayed on the screen may not exactly coincide with the real ones: the highest level of detail is applied to close objects, while for the purposes of physical calculations and aiming, the lowest level of detail is used. This is implemented in order to reduce the load on the CPU and improve game performance. In some cases, vehicles captured by auto-aim do not correspond to the player’s plans. We have tested different mechanics for auto-aiming, and the current version proved to be the most suitable one. Unfortunately, none of the models of the auto-aim behavior is able to predict the thoughts and intentions of the player, so it is impossible to fully eliminate such situations. Due to the specifics of map terrain, static objects, and tank collision models, as well as physical restrictions (related to the accuracy of simulation), situations sometimes occur where a tank gets inside objects or gets stuck in them and is unable to move. When the tank gets stuck, it is affected by buoyancy forces from several sides, which exceed the propulsive force of the engine. When the tank gets inside closed objects, buoyancy forces compensating each other are in effect, so the tank gets the ability to pass through the wall. As these bugs occur in specific places on maps and relate to particular tanks, they cannot be fixed altogether at once. All reports of such bugs are examined thoroughly, and then the respective fixes are made to the map or tank model. Nevertheless, new issues are regularly found. So we work on improving the accuracy of game physics, which will allow us to, if not to completely eliminate this problem, then significantly decrease the number of occurrences. The serious reworking of such a complicated in-game aspect like physics takes a lot of time for objective reasons. Keep in mind that this article is made not for listing all the ingame problems but for explaining the most frequent issues which players consider as bugs. I'm using an iMac running MacOS High Sierra and today (02/14/2018 at 22:37 JST) my Tetrarch's turret was stuck. I could only move the turret by doing a left or right click on the mouse and after releasing the click the turret followed. All controls worked fine and it was only the turret that didn't move. There were also some bugs that I have experienced during the event when the game stalled several times. There was a time where our tanks went out of control and went over the red borderline then the game stalled and after a minute the game continued as if nothing happened. There were also 3 different battles that properly finished that didn't register or came up. I had one just right now at tier 6 and it ended where the screen just stalled that I have to hit the "return to garage button". After 10 minutes the battle result is still missing. As always I can send platoon invites but the game will not start. What we do to get in a platoon battle is that my platoonmate will invite me and we can both enter the game. 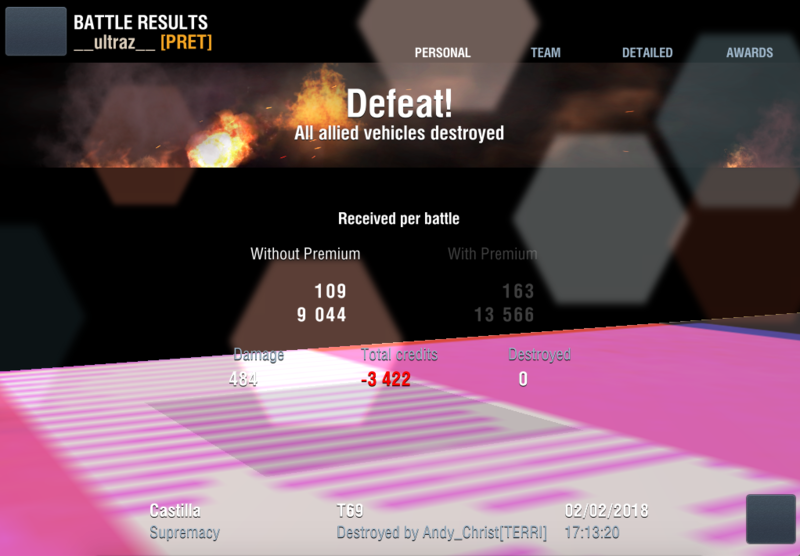 PS: Could WarGaming also kindly check the the present quality of the match making. I will not say anything about the MM quality because I'm sure that WG has the data to tally all this up. Edited by Ronnel_999, 14 February 2018 - 03:10 PM. I have serious FPS drops in Castilla , vineyards and himmelsdorfs. I am using windows 10, I have experienced some bugs when I play in winter malinovka and other maps with snow, my graphics is very lagger or delay.But in other maps that have no snow my graphics is not lagger or delay. Are you trying to say that while trajectory of the shell is calculated on the server, tracer on the screen is calculated and displayed by the client? Why is that, would it not make more sense to display tracer based on actual (server) shell trajectory? Then at least we could see where the shell actually went. If really "the gun ignores the marker" and it's not a typo, it is a nonsense. Marker could intentionally ignore auto aim in this case, but NEVER should gun ignore the marker. Please don't excuse a mistake as "game specifics". Thanks. Again, wrong statement. It is very easy to predict the thoughts and intentions of the player. IF a player aimed at one (red) tank, and the auto-aim is on, "thoughts and intentions" are that marker will stay on this tank and follow it. And certainly there is no "intention" that marker will suddenly jump and stick to another tank (even green!!??) or do some other crazy things. Auto aiming was working properly until it was ruined in one of updates, and now (after initially confirming the problem, then waiting so long so everybody forgets about it) you are saying you have found this ruined mechanics more "suitable"? Suitable for who exactly? It's not suitable for me.